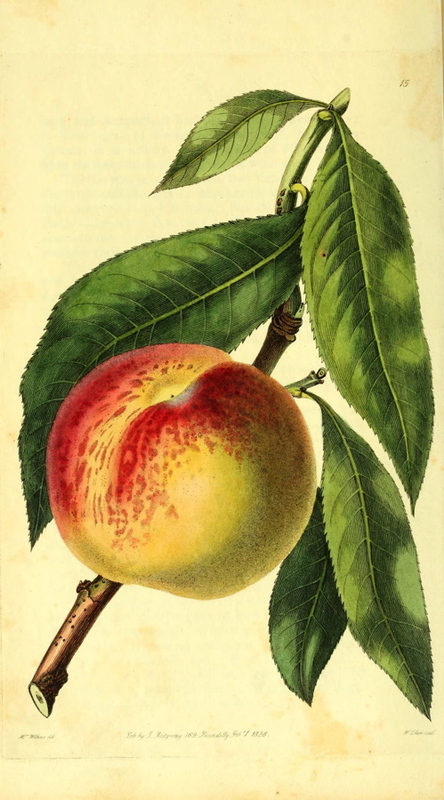 A Prunus persica (L.) Batsch. cultivar. ‘Flowers large, pale. Fruit middle sized, generally depressed at the apex, with a broad shallow suture on one side, and slight traces of one on the other. Skin, on the shaded side, pale dull greenish yellow; next the sun, broadly marked with broken blotches of dull purplish red. Flesh greenish yellow, with a slight stain of purple next the stone, from which it separates. Juice plentiful, very rich, with an extremely agreeable vinous flavour. Stone middle sized, oval, pointed, rather rugged. Ripe the end of August and beginning of September.’ [George Lindley – Orchard Guide p.260/1831]. ‘This variety is said to have the merit, in addition to its excellence as a wall fruit, of ripening well on a standard tree, in Normandy, — a climate so little different from our own, that it is to be presumed the kind will be found to possess the same property in England. The sort cultivated in Normandy was a short time since supposed to be a variety distinct from the Pêche de Malte of Duhamel; but from plants grown in the Garden of the Horticultural Society last summer, the two are now judged to be the same. Upon the authority of Miller, the Italian is said to be a kind nearly the same as this. In France it is sometimes called the Belle de Paris.’ [PM t.15/1828]. ‘Malta is supposed to have originated in Malta or in Italy but the Italians did not mention it until it had been known in France for some time, Merlet having described it in 1667.’ [Peaches of New York p.412/1916]. A hardy tree. A first rate peach which keeps well. ripening early August. Recommended as part of a succession on a south aspect in England. [Gard. Chron. 1849, Don]. Listed in an Addendum to the 1857 catalogue as ‘Malta’ [Peach no.15/1857].